The migration to cloud computing is like the gold rush days, a mad stampede of companies betting the farm on new business models powered by shiny nuggets of emerging technology-driven capabilities. While new cloud services are being driven by rapidly changing technology, it is important to remember that as a consumer of cloud services you’re not buying just technology but rather the services that they enable. This is true whether your cloud services are delivered ‘in-house’ (i.e., a private cloud), through a third party (i.e., a public cloud) or via some combination of the two (i.e., a hybrid cloud). This is relevant to performance monitoring for a number of reasons. Convergence is happening all around us. Hyper-converged infrastructures are making it easy to scale with increased flexibility, easier management, and lower CAPEX costs. But as with any hardware infrastructure, hyper-converged infrastructures can experience performance bottlenecks, and IT staff need to keep constant vigil on the hyper-converged framework, identify bottlenecks and fix issues. In addition, application complexity is increasing and monitoring is now an essential element of success in the digital enterprise. Services are a mix of applications, infrastructure and deployment models. The reality for the vast majority of customers today is that it’s a mixed bag from a technology perspective. Most organizations are frantically attempting to move to the cloud, which in many cases is why they are migrating applications and infrastructure. The challenge is that your current IT services are where the value to your existing customers is being created, and all the good intentions in the world won’t change that. You must manage today’s environment and value delivery, while simultaneously preparing for the future. For most, this is an enormous burden and presents unique challenges for performance monitoring of digital business services. Not normally thought of when you hear the word ‘convergence,’ but the IT silos of the past are rapidly changing as well. Cross-domain service teams are converging multiple disciplines, sharing knowledge and must adopt a service model to succeed in the new world. Unified monitoring solutions must cross-correlate code-level and transaction-level performance with the health of the supporting physical, virtual, container and cloud infrastructures. This is an important element of transforming IT and establishing a culture of observability and transparency. 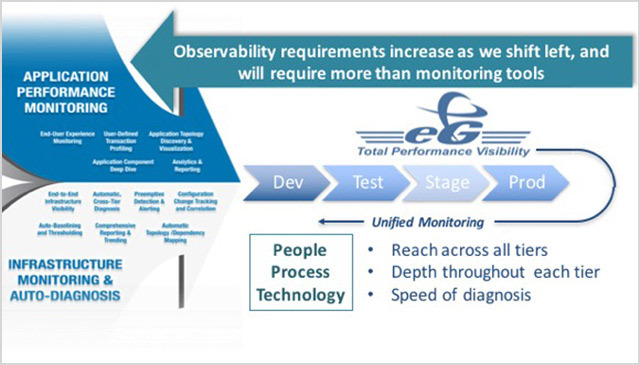 These requirements increase as monitoring shifts left across the service lifecycle and require more than technology. Most organizations cannot simply ‘hot-cut’ legacy IT systems to a cloud-native world overnight, even if the technology would allow it. People and processes will need to catch-up. 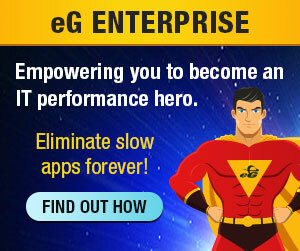 eG Enterprise converged application and infrastructure performance monitoring can help customers establish a path to the future without abandoning the present.